As discussed in my previous blog, I learnt that I fell into the digitally native (Prensky, 2001) category and could be categorised as a digital resident (White, 2011, White & Cornu, 2011), due to my passive nature online. Prior to undertaking research for topic one, I naively considered everyone to have an equal level of access and exposure to the web. This is primarily thanks to my upbringing, in which I had digitally literate parents and access to the web via the use of a laptop and phone from a young age. This transcends to now, where the web is pivotal in facilitating my education and my part-time job as a digital marketer for a start-up tech company. Although I come from the South West, which is one of the regions with the lowest access to the web, I consider myself to have been the beneficiary of the digital divide, having had a higher access to the web than most. However, as I can see from conducting research, the digital divide particularly impairs those who come from a lesser socio-economic background, whether it be ethnically diverse, disabled, regionally diverse or simply being elderly. Halford, S., Davies, H. and Dixon, J. (2017). Digital differences – inequalities and online practices. University of Southampton Audio Transcript, [online] p.1. Available at: https://ugc.futurelearn.com/uploads/files/1f/aa/1faadfb0-777f-4ef7-8741-e032127ea311/Digital_differences__-_inequalities_and_online_practices.pdf [Accessed 24 Feb. 2018]. Ons.gov.uk. (2017). 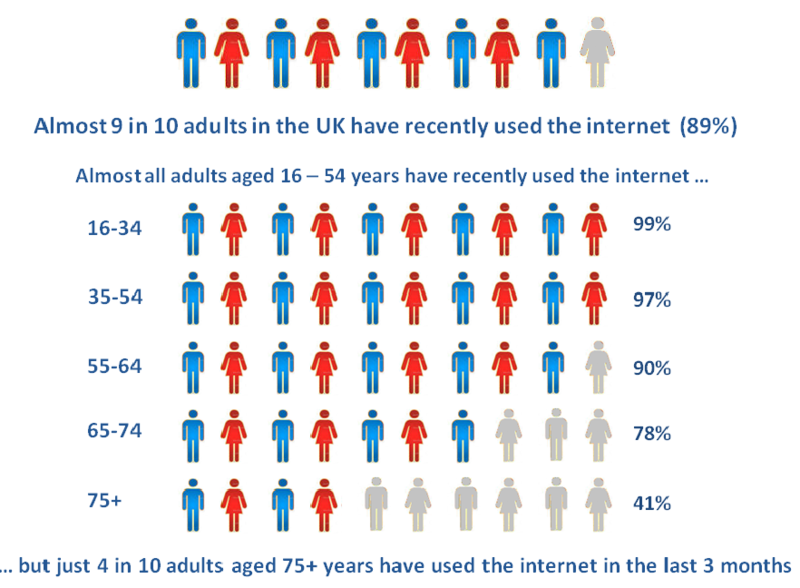 Internet users in the UK – Office for National Statistics. [online] Available at: https://www.ons.gov.uk/businessindustryandtrade/itandinternetindustry/bulletins/internetusers/2017 [Accessed 24 Feb. 2018]. TED. (2016). When we design for disability, we all benefit | Elise Roy. [Online Video]. 16 June 2016. Available from: https://www.youtube.com/watch?v=g2m97gPI70I. [Accessed: 24 February 2018]. Zickuhr, K. and Smith, A. (2012). Digital Differences. Pew Research Center, [online] 1(5), pp.1-30. Available at: http://www.pewinternet.org/files/old-media/Files/Reports/2012/PIP_Digital_differences_041312.pdf [Accessed 24 Feb. 2018]. Great blog, I really enjoyed the meaningful use of figures and statistics, which really added to your argument. It is interesting to see the conclusions you reached from your wealth of research, and I think they are well substantiated. I would like to ask how you think it is possible we can overcome the Digital Divide, or whether or not you have given it any thought? This recent policy brief includes a number of potential steps, particularly interesting in how it propose to “connect the unconnected” – and I was just wondering your thoughts on this? Thanks for taking the time to comment on and read my blog post, I really appreciate it. In regards to your question, no, I have not given it much thought before you brought it up. The policy you discuss brings up some really comprehensive ways in which we can ‘connect the unconnected’. I feel that some of the point, such as liberalising the market for satellite dishes and internet connection, could offer some real chance for the gap to be bridged. However, it would be difficult to simply un-monopolise such markets in ways discussed within the article. But, it is a comprehensive starting point for a strategy to connect the unconnected. Great blog- I really liked you use of YouTube video and graphs, these made you points easy to visualise. Throughout your blog you have focused on the amount of people that the digital difference affects in the UK, however I would be interested to hear your thoughts on how exactly this divide affects these people who do not have the same access to the internet to the majority? That’s a really interesting article you have linked to, I think ultimately if you have less or no access to the web it is a massive setback and hinderance socially and economically. The job market and social opportunities that become accessible through having even basic digital knowledge and skills are extensive. What are your opinions on the effects of the digital divide?